Even at the start of 2019, supply chain managers were still grappling with tremendous uncertainty over what would happen with the tariffs imposed by the U.S. on Chinese imports, as well as the reciprocal Chinese tariffs on U.S. goods. Would tariffs double on March 1 as threatened by President Trump? Would prospects improve for a trade deal in the second or third quarter? Would the U.S. trade representative grant more tariff-e tariff-exclusion requests from U.S. importers on top of those granted for 984 products in December 2018? Among the top industries impacted are automakers. U.S. auto giants GM and Ford both announced in that anticipated tariffs on metals would cost them each approximately $1 billion in profits annually. Resilinc’s analysis of our customers across industries shows that 278 supplier sites in China responsible for 42,000 parts and supplying 5,000 companies would be subject to tariff increases under Section 301, the section of the Trade Act of 1974 that authorizes the imposition of tariffs in response to unfair trading practices. To plan for an uncertain future, companies importing these parts should model and evaluate multiple scenarios, ranging from Best Case (in which China agrees to relax its currency protection measures, allow more joint venture ownership, improve IP protection—and in turn both countries reduce tariffs) to Escalation Case (in which the parties don’t come to agreement and escalate with additional tariffs). 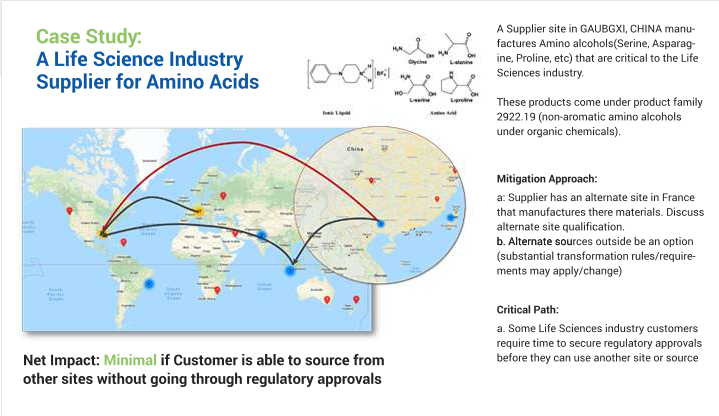 Mitigation playbooks should be developed, as illustrated in the example below for an amino acid supplier. Lack of visibility in lower tiers of their supply chain puts many companies at risk for surprising China-US tariff impacts. One example from the food and beverage industry: A large U.S. based food manufacturer was hit with a significant short-term price increase on a commodity ingredient that it used in large volume—a commodity that it had assumed originated in the United States. When procurement staff inquired about the increase, they were shocked to learn that their supplier’s supplier had been receiving this commodity from a Chinese company for many years, and it was simply passing on the tariff costs. Many importers of Chinese parts and materials sought exclusion from Section 301 tariffs, making the case that the items could only be obtained from Chinese suppliers, or that sourcing them from other countries would cause severe economic harm. Of the more than 11,000 exclusion requests received from companies and industry associations, the U.S. Trade Representative granted exclusions for 984 products in December 2018, including papermaking machinery, ball bearings, thermostats and non-electric water filtrations systems. The USTR also denied 1,258 exclusion requests, and as of January 2019, it had not issued decisions on most exclusion requests. Exclusions last for one year and apply retroactively to imports on or after July 6, 2018. • The End Goal is not a Trade War. • In This Negotiation, Both Parties Have a Bad BATNA. • There is Potential For Significant Economic Dislocation. • There is Potential For Economic Dislocation Beyond Increased Tariffs. • The Dislocation Could Last For Some Time. • All of this Plays Out Against backdrop of the 2018 and Even the 2020 Elections. The new tariffs on Chinese goods arrived just as companies were absorbing another wave of impacts on their Chinese suppliers and sub-suppliers: pollution control measures enforced by the government led to the shutdown of more than 86,000 supplier sites in 2017, and significantly more are expected to shut down as a part of the Three-year Action Plan for winning the Blue Sky War. If you refer to the map below, on the left you see the Chinese industrial region highlighted. On the right, you see in green, the regions affected by pollution control. The cluster of black dots on this map represents all the Resilinc researched sites and it lies in the industrial region. Which is no surprise. If you take Zhejiang as an example, this is a manufacturing hub for steel, small commodities, electric tools, hardware, plastic and others. The There is likely chance that these sites could potentially be shut down due to pollution control.